This is a calculator gadget for the Windows Vista sidebar. 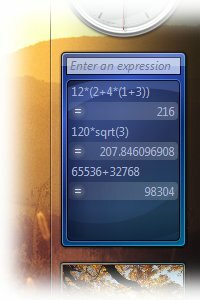 Unlike traditional calcuators, which can perform only one function at a time, Express Calculator accepts free-form expressions such as 7*(9-2). Express Calculator also displays the last four calculation results, allowing you to refer to your previous answers.